Going green. Let’s make it literal. 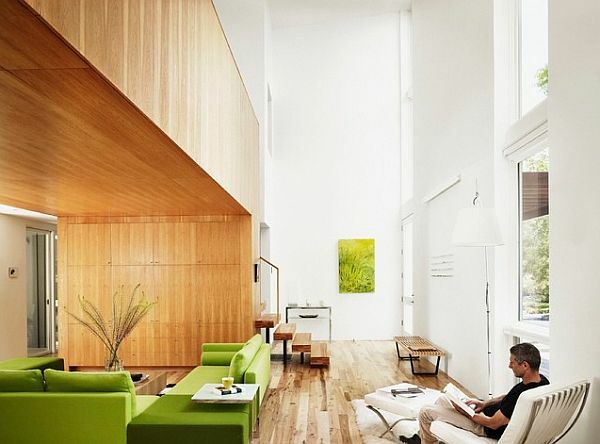 Let’s go green this summer and invigorate our quenched homes with this lively color. 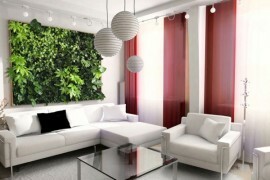 Earth friendly and inspired you can have a green room that brings the sensation to life you are looking for. 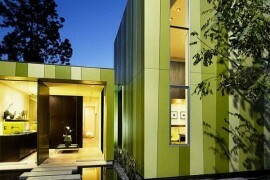 The sensational green initiative has swept across nations with philanthropic haste. From how we buy stuff, to how we dispose of it and everything in between we, the human race look at waste production and the dilemma it causes in an entirely new and understanding way. We strive to reduce our carbon footprint, reuse what can be repurposed and recycle so that green industries can create 100% post consumer products that have a history and are now reincarnated as shoulder bags made out of newspaper. It’s a beautiful thing, but I must admit that the steps taken to secure a more clean environment for the future is wise but I wish there were just a little bit more green involved. This color that defines Ireland in over dozens of shades, tops our trees with lushness and bears the weight of our feet in the outdoors deserves some more credit in our lives as we responsibly strive for a greener planet. From our prepackaged, fast food mentality the kitchen is one of the most common rooms that needs to undergo some literal and figural green TLC. From the amount of plastic bottles, bags, and containers we throw away that could build us a float the size of the Titanic to the water we let run in our sink that would keep the Titanic afloat, there are hundreds of target areas that could be improved. And while it takes considerable effort and planning to instill the green thought pattern in our mind and actions we can devise a creative way to remind us of our purpose. 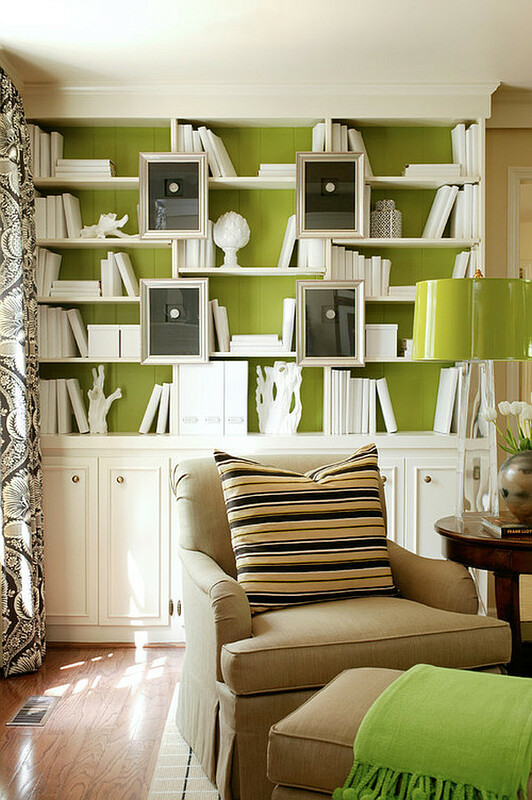 A touch of green here and there and we will have green on our minds all the time. 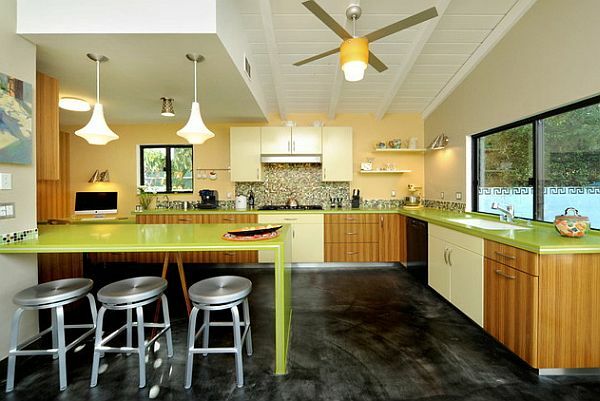 Bringing green in the home, specifically the kitchen can go wrong so fast and with a smidgen of the wrong shade your modern green can go horribly retro and you don’t want it to resemble a room straight from an episode of That 70’s Show that featured Ashton Kutcher and Mila Kunis and their cast mates in numerous rooms bearing the stereotyped 70’s green. 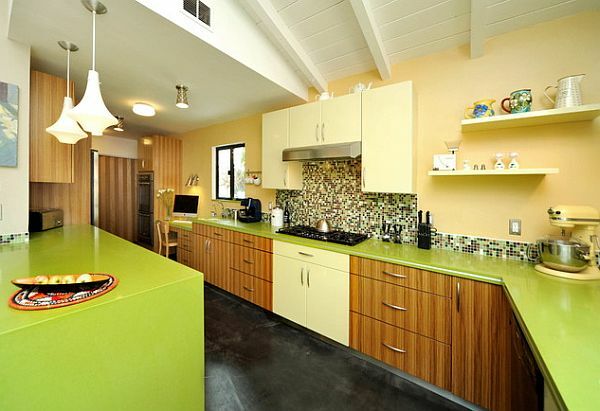 So with several green themed kitchens, you can DIY and artistically bring this earth friendly color into your home. 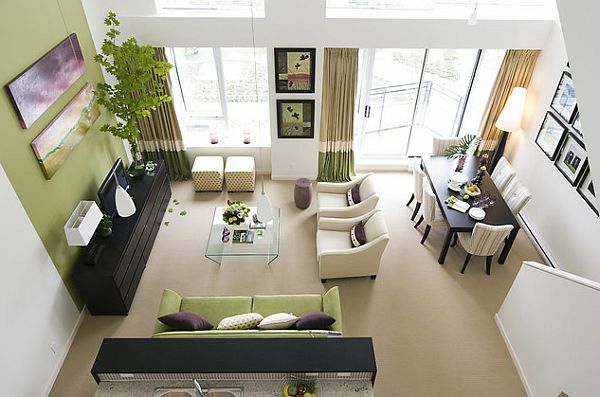 This a room that will welcome green into its perimeters with all the other colors it already hosts. The Shabby Chic kitchen dares to mix rather than match shades of green from ceiling to tiled floor. 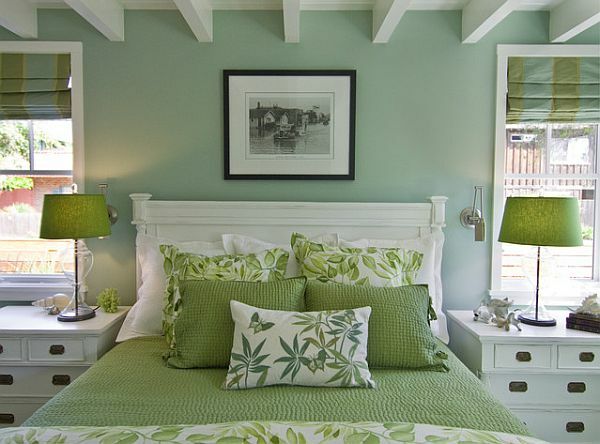 A soft mint green as your cabinet base to sponged pale lime green walls. The quintessential shabby chic has floral curtains fluttering at the open window with popping flowers on a green background, once again another shade of green. It also features painted cement floors to match the walls with a softer color for the trim and borders. 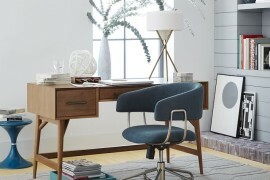 It’s mismatched and quirky and yet it works. 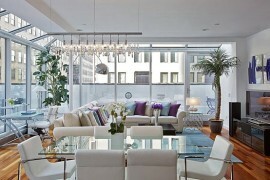 It’s like a breathe of fresh air for your eyes in its uniqueness and approach to a color that is diverse. Green with a touch of blue and you can see how easily it is to delve into an entire new spectrum of green. 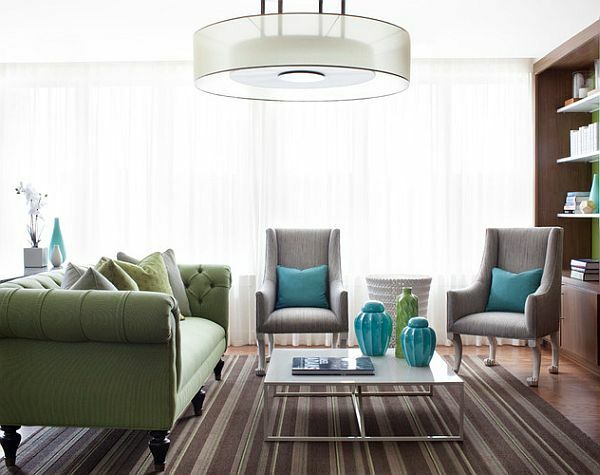 Teal, aqua, these offer a different insight to your expected grass green. 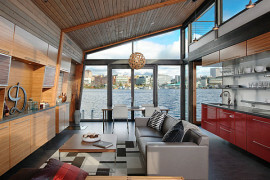 It is these shades that blend well with mustard yellow, black, natural or stained wood, stainless steel or even slate. Since this color compliments and gets along well with others as it hosts part of a primary color, you can spice up your walls with a contrasting accent wall and even broach wallpaper that has strokes of your wall color while introducing a majority of a new color. 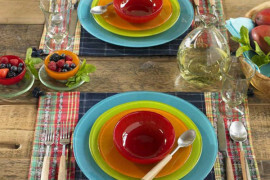 Your glass windows or a collection of glass vases and jars are strong design elements that will continue to thread your base color throughout your new kitchen. Think industrial. 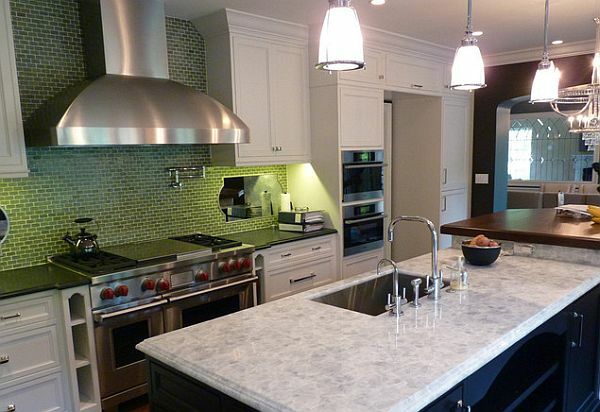 Stainless steel appliances, glass surfaces and one hue of a bold green to introduce some break in the consistency of a clean and uncluttered modern kitchen. 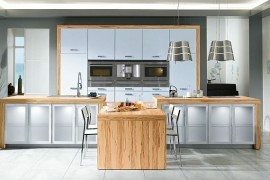 One color only on the walls and even though you have opted for a more liberal approach to painting your kitchen, the solid color featured on your walls will allow for your Type A personality to withhold control and keep a strict grasp on order and structure without compromising color or creativity. When you have designed an area like this, any decorative countertop pieces should not steal away from the glory of the solid walls, so stainless steel appliances or white canisters will add levity to the contemporary room. 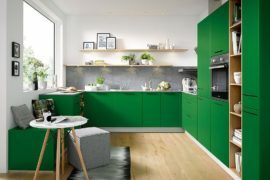 The average DIY interior designer or neighbor who has just acknowledged the need for a remodeled or renovated kitchen will opt for this safe autumn apple hued kitchen, if green even dares to enter the equation. But when it does it is the appletizing color of a natural green. 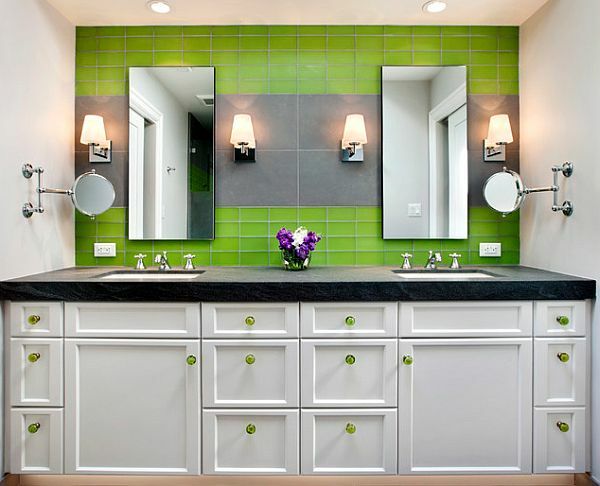 To achieve the overall look of an apple inspired kitchen without the kitsch apple curtains and baskets of synthetic apples everywhere you begin by replacing the wood cabinets with your selection of green paint. Cream walls and wood flooring and the basics are done. Infuse deeper and lighter shades of your cabinetry on your wall, a rug at your range and sink, and you have a traditional kitchen with a bit of nature everywhere you look. From chlorophyll to energy, to frogs, a stormy sea and emeralds the world has extended a palette of colors for us to choose from and to inspire all those who enter our kitchen to live a bit greener, both in our love towards earth, and in our passion for a color that compliments.